Two of the most talented and fiercely independent video game creators I've ever met are joining us today, right below these words I'm writing, to answer your best questions. We've got Jonathan Blow, the man who brought us Braid and is leading development on the lovely island-exploration puzzle game The Witness. 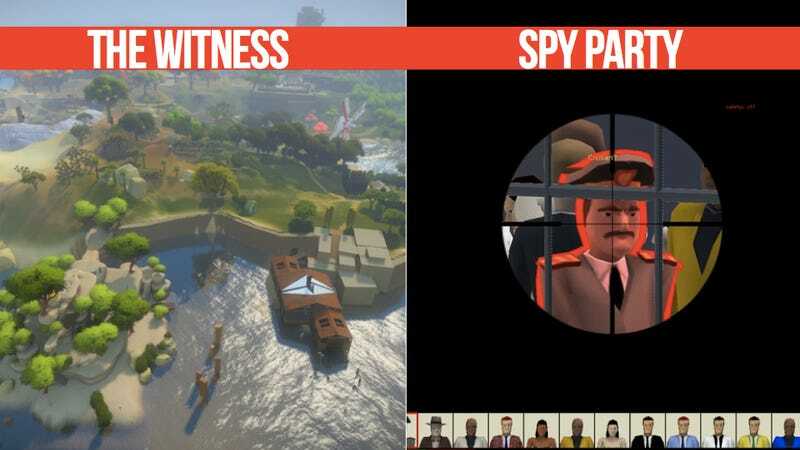 And we've got Chris Hecker, no longer working for The Man, and now toiling on the ever-fascinating, spy-vs.-sniper multiplayer game Spy Party. That's right. Two game creators here for you to interview...for the price of one. From 2-3pm ET, Hecker and Blow will answer your questions, live, in the comments section below. This is our first interview using this new format, so a few pointers: 1) All readers can submit questions by typing them below. 2) Our interviewees will answer the best questions live; refresh the little circle-arrow to see the latests. 3) By default, you'll see all the answered questions, but you can toggle and look at every question that's been asked, if you want to avoid duplicating anything. Ready? Ask away! Interview ended. Wow, that almost went too well! Thank you to Chris and Jonathan for doing this and to all of you for asking great questions. We actually got more questions and answers than we anticipated, so they're rolling right off the page! You can see most of the answered questions below, but if you want to see every single one of them, you will have to click on Show All Questions.We'll have ironed in the future so you can see every answer in one nice long scroll. If you liked this, then I have some good news: we're going to be doing more of these.